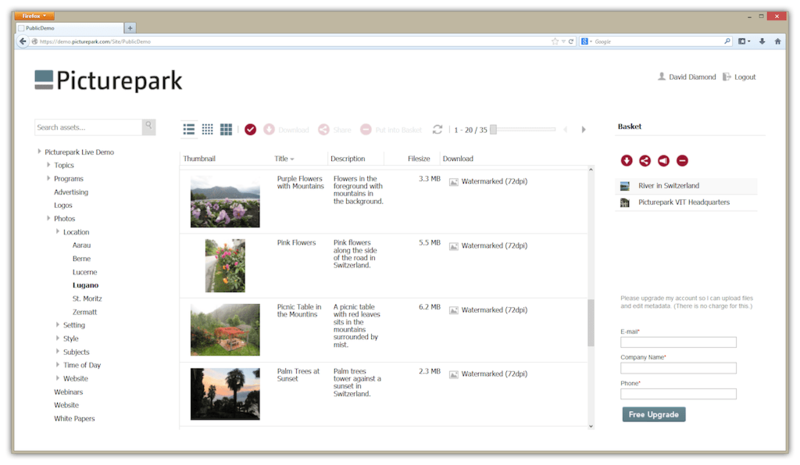 Picturepark allows you to take control of your data and workflows. It acts as the central platform where all media assets are stored in their master form and then automatically transformed into the required output formats. Thanks to a powerful yet simple permissions management, stakeholders can only access the content and functionality that they need. Picturepark is available as SaaS (Software as a Service). This means there is no need to host the software yourself, eliminating the need for servers, storage and internal IT support. You simply pay a monthly subscription fee and all of the technical infrastructure is taken care of for you. Picturepark is also available as “On Premise” software that is installed onsite at your location. This can be a more cost effective solution if you have a large number of users, big storage needs, special security requirements and require local network speeds. Contact us to learn more about Picturepark.